Click here to read this Newsletter on the web. This will give you the best quality for viewing especially the pictures. Picture: The eye of a beast. 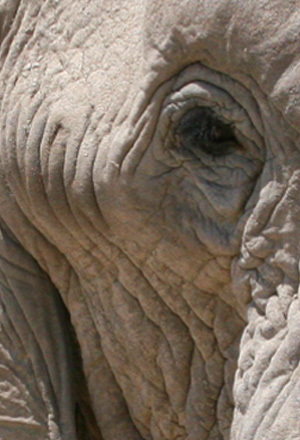 Picture of this elephant taken by Gené Braaksma in Etosha, Namibia. First of all do we wish you a blessed time of Easter with your loved ones. May the death and resurrection of Christ our Lord be a reality in your life. "For he is risen as he said..."(Matt.28:6). It is Autumn in the Kalahari. We enjoy fine and mild weather this time of the year, and as lirycal and poetic people can be about "October", so inspired and thankful we often feel in April here in this semi-desert area when it is so lush green as again this year. As you can see on the collage above, have we had, for a few weeks in February and March, yellow flowers (Tribulus zeyheri, as you correctly identified them on our Facebook picture, Steve), as far as the eye could see. It was so pretty. 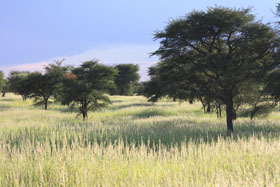 Now that their time has come to an end, the fields are covered with tall green Kalahari sourgrass (read also Dawie's encounter with these grass later in this Newsletter). The acid levels of the grass are still very high, but soon it will become dry and yellow. The animals will devour it for months to come until the next green season. We can only thank the Lord because our "barns are filled with plenty" (Proverbs 3). On the picture you can see our children Jan-Hendrik and Isabella... happy to have such a display of flowers to see. On the collage Maria is emptying the rain gauge. After a rain shower, we as family usually jumps in the vehicle and drives off to measure the rain which has fallen on every part of the farm. When we drive up to a gauge, each try to be the first one out to take the measurement. First one out of the vehicle has the honor. On other pictures included, is Michael with a young mare that needed to be tamed. He took her to the point of handling, but she wasn't ridden yet. Not many volunteers around here for this strong, tall mare. Isabella sits here on another (tame) horse. The bulls of the herds are starting to breed. See the Blesbok with young lambs. We find more and more Kudu bulls among the cow herds. 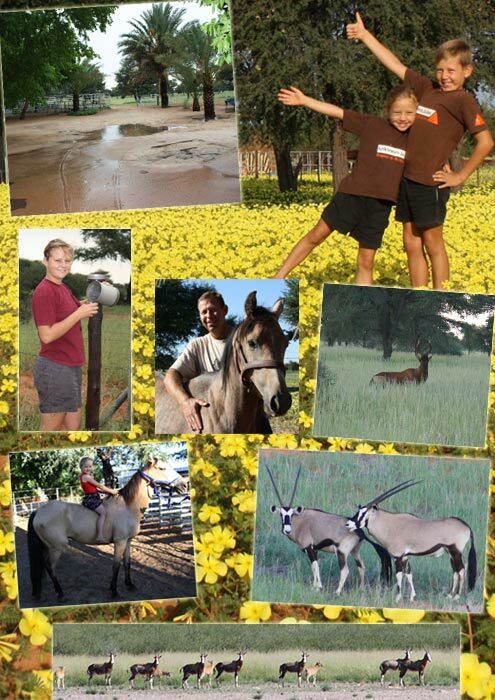 Also, see on the collage a Gemsbok bull "flehmening". In the flehmen response, animals draw back their lips in a manner that makes them appear to be "grimacing" or "smirking". Flehming allows the animals to determine several factors, including the presence or absence of estrus and the physiological state of the animal. This particular response is recognizable, for example, in stallions when smelling the urine of a mare in heat, or in bulls like this Gemsbok above. We find this response in ungulates and many species of mammals. We recently had John MacDonald from Washington, USA with us for a visit. John hunted several times with us before and is one of our special friends. He lost his beloved wife Eleanor to cancer in November 2011. We enjoyed a quiet and relaxing time with you, John. Thank you for your kindness and gentle ways. We'll report about your one, adrenaline-filled hunt with Hendrik and Michael in the next Newsletter. We now have 400 subscribers to our Newsletter. Welcome to all those of you who haven't received them before. May you enjoy them. We apologize for any grammar mistakes. English is not our home language, but we try our best to use English as correct as possible. We received over the years wonderful comments on the Newsletters. Thank you for each comment. It is an inspiration and motivation to continue reporting to you about the visitors and events of the nature and wildlife of the Kalahari region, Namibia. 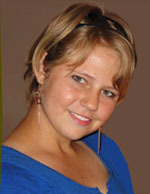 Alwyn, hoe kan ons vergeet? Dankie vir jou reaksie! "Thank you for your letters and your faith. A little more information about the clients weapon and cartridge would be enjoyed." ~ Raymond, USA. We'll give heed to your suggestion, Raymond. Haven't really think about that before. What can we say, Pete? Thank you. May everything we do, think and say continue to be according to the will of God and may it glorify Him. "Our works are good when the will of God is the rule of them, and the glory of God the end of them; when they are done in his strength, and for his sake; to him, and not to men." The new free wallpaper for you this month, is a picture of male Ground Agama in breeding season. See the thumbnail on the right here for a preview of the wallpaper. Click here to get this month's picture on your desktop. 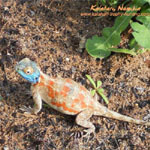 "In the Kalahari we have a very beautiful little animal known as the Ground Agama. It is mostly shy, but when it does come out during the breeding season, they are some of the most colourful little animals. 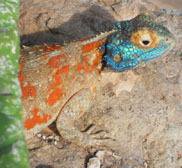 The Ground Agama has a triangular head and a rounded snout. He is covered with scales all over his body and they overlap towards the snout. His fifth toe is long, reaching to the end of the first toe. Both sexes have a long tail, even longer than the head and body itself! Males' bodies are olive to reddish brown and sometimes grey to yellowish. The belly is creamy white to a pale, dirty pink colour. 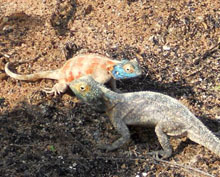 Ground Agamas mostly eat termites or ants. When they're disturbed, they will run at their top speed with their tails in the air and after some distance, they wil stop in their tracks and hug the ground, depending on their superior camouflage to escape the danger. They breed during the raining season here in the Kalahari. We often see the males, with their vivid breeding colors, advertising their status on fence poles. In the breeding season, the males develop their most dramatic markings (see the pictures). Outside of the breeding season, the male is a plain brown. The female lays between 8 and 18 eggs, usually in a hole in loose sandy soil. They dig the hole usually under a rock or some kind of bush so that a predator might not easily disturb it." "Some people ask why men go hunting. They must be the kind of people who seldom get far from highways. What do they know of the tryst a hunting man keeps with the wind and the trees and the sky? Hunting? The means are greater than the end, and every hunter knows it." 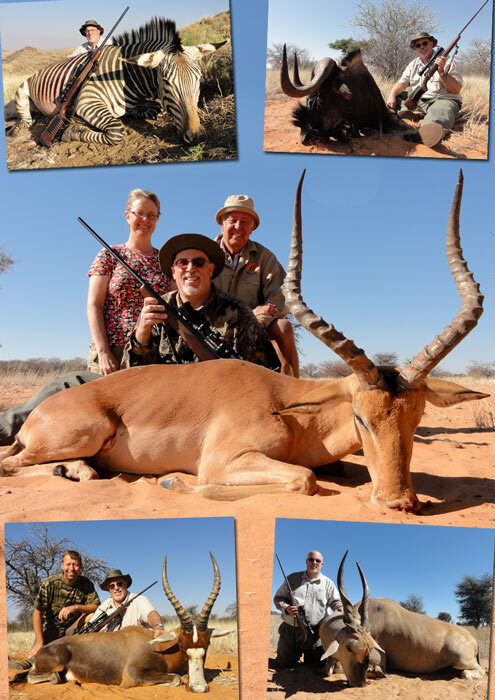 Above: Pictures of Terry's Namibia hunt. 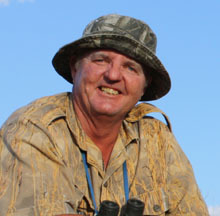 He hunted a Gemsbok, a Mountain Zebra, an Eland, a Black Wildebeest, a Blue Wildebeest, a Blesbok, an Impala and a Springbok. All trophies. Terry used his .338 Wincester on all these animals. Terry left this special rifle for Michael as a gift. What a gift! You can imagine what it means to a Kalahari hunter. Thank you Terry. It will be put to good use and we'll always remember you for this. 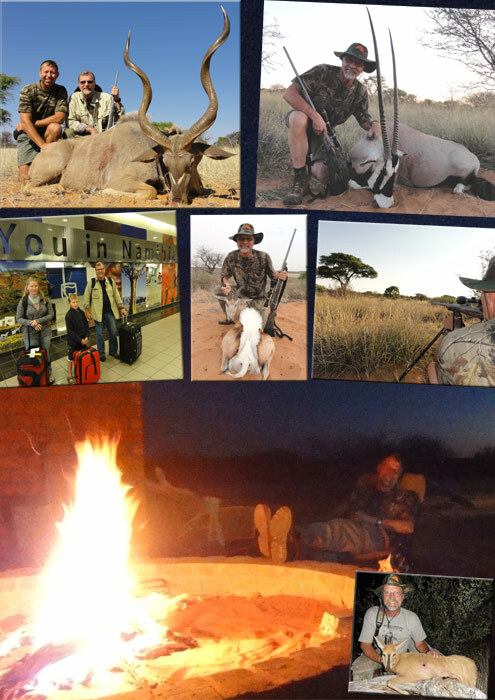 Above: Pictures of Gené's Kalahari hunt. He got a Duiker, a Gemsbok, a Kudu, a Steenbok and a Springbok. Gené used Michael's 30.06 with 180 gr. bullets on these trophy animals. 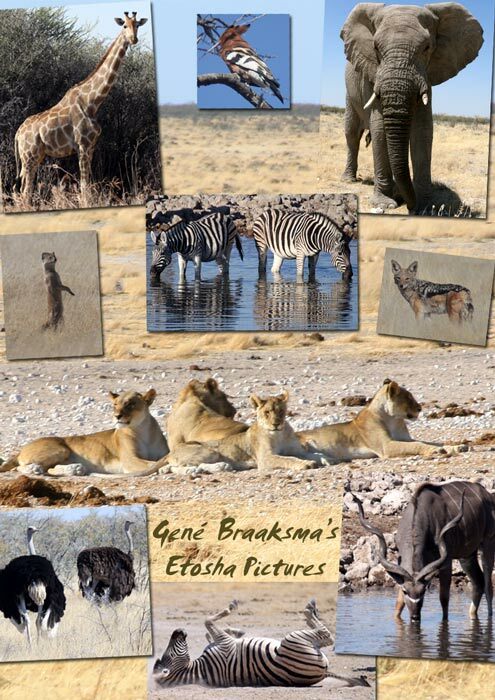 We took Terry and Kay to Kgalagadi and Gené and his daughter Erin to Etosha parks during August and September of 2011. Because of our changed circumstances with a child in boarding school, it may not always be possible in the future to do this for every client who are interested. We will however, if it is not possible for us, refer you to a reliable company or person if you are interested to do such a side-trip while in Namibia. These parks are wonderful to visit and a paradise for outdoorspeople. Above: Pictures Kay Hoitink took in Kgalagdi Transfrontier Park. Terry and Kay went with us on a side-trip to this park in the heart of the Kalahari. 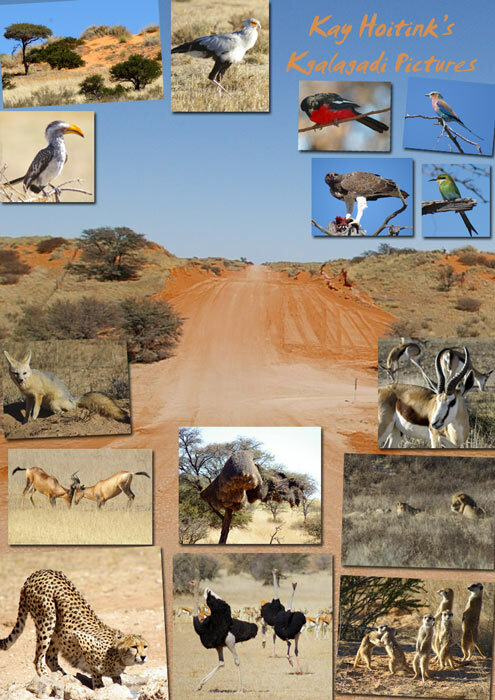 The Kgalagadi Transfrontier Park is a result of the historic 1999 unification of South Africa's Kalahari Gemsbok National Park and Botswana's Gemsbok National Park. This is the first formally declared transfrontier park in Africa and was officially opened on 12 May 2000. The size of the park is overwhelming. The South African side comprises 9 591 sq.kilometres (3 703 sq.miles) with a further 28 400 sq.kilometres (10 965 sq.miles) on the Botswana side. This Park is almost twice as large as the Kruger National Park, making it one of the largest National Parks in the world. The estimated large predator numbers in Kgalagadi,are: 453 lions, 594 brown hyenas, 151 leopards, 204 cheetahs, 374 spotted hyenas. 264 species of birds have been recorded in the Park, of which 78 species are residents, 16 seasonal migrants and 18 nomads. Above: Gené Braaksma took these pictures in Etosha, Namibia. 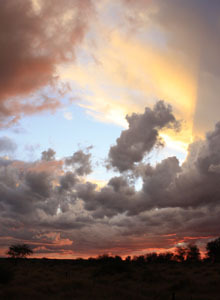 Etosha Park celebrated its 100th anniversary in 2007. It is currently one of the oldest game parks in the world. 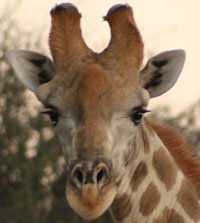 The word Etosha translates "Great White Place"
The size of the huge white pan, after which the park was named and which is located inside the park, is 4 590 sq.kilometres (1 772 sq.miles). It is an immense white, usually dry, flat area. "It was April and with all the good rain, Uitspan was beautiful and green all over. I love April as it is not too hot and not too cold. Michael asked me to help him hunt with a group from Europe. They were a good bunch of guys and good hunters. But... there sometimes is a "bad" apple in the basket and it was my privilege to guide him. He was a know-all-done-all kind of guy and the worst shot/hunter that I ever encountered. We usually start our hunt early mornings after having coffee and rusks and doing the necessary toiletry. That morning the client wanted to hunt earlier and we left camp prior to day-break. I wore long pants and a shirt with the pants tucked into my boots. The grass was long and wet. Although still green, nothing ate the grass as it was still producing acid. The acid content of the grass is so high that the animals lose hair above their hooves. The horses’ legs as well as their mouths even sometimes bleed due to the acid eating away the skin whilst grazing. This type of grass (Schmidtia Kalahariensis) is very common in the Kalahari and also known as Schmidtz Sauergras (German), Bushman grass (English) and Kalahari suurgras (Afrikaans). I was walking in front with the shooting sticks and no rifle and Mr Know-all was walking right behind me. We previously had some snake encounters which had him follow me closely. Whilst still trudging along in the dark we had many encounters with thorns from the brush. We also had some contact with Impala and Kudu but the stalks were unsuccessful. I later saw that, when I would stalk left of the bush, Mr Know-all would stalk to the right of the bush. I now had to keep my eyes on the client as well and would nudge him back in place with the shooting sticks as soon as he chose his own path. The sun said hello for the first time when we were about 5 miles from camp. As we had a very early start, I did not do my usual visit to the toilet. The previous evening we ate barbequed Eland fillets as well as several of Tienie’s special side-dishes. I ate too much of the delicious food and my stomach was starting to act up. I could later not contain the pressure that was busy building up inside of me. I would then stop, lift the binoculars and pretend searching for game whilst I would filter some of the pressurised gas out. I must admit that though the process was soundless, it had odour…especially to the guy walking behind me. After a couple of these stop-seek-and-filter sessions I saw that the hunter was falling behind... well behind. As we were walking against the wind, as any good hunter should, I realised that he was receiving the full 100% of my gas. I decided that I had to do something about the situation. I thus aimed for a dune and increased the pace slightly to get there quicker. The gap between us opened to 5 yards. It was then that I saw this beautiful big Cape Cobra basking in the sun. I pointed it out to the client whom immediately came to stand next to me. I watched it in awe as it was one of the biggest that I had seen. He watched in fear as one of Africa’s deadliest was barely 2 yards away. We continued. I aimed for the dune and resumed pace. Mr Know-all was now following so close I could feel his breath in my neck. When we reached the top of the dune, I found him a nice look-out spot and had him seated and searching for game. I excused myself and aimed for a Sheppard’s tree in order to get rid of my hindrance. To my dismay I brought no toilet paper and the client also had none! Still, the job had to be done. After completing the required, I used some of the grass close by in order to do the cleaning business. The grass was for free and I used a large amount to do a thorough cleaning. I pulled up my pants, fastened the belt and went over to Mr Know-all who must have been relieved as I got rid of the gas problem. From the dune we saw some Oryx and proceeded towards them. It was when we reached the foot of the dune that the first ant bit me. It bit me right there where I did the thorough cleaning job. I slammed on the brakes and tried to squeeze it to death... all to no avail. Instead of dying, the ant multiplied to a hundred and all bit me at the same time. By now I was in dire pain and just as I thought things could not get worse, the ants changed into hornets and all let fly, stinging me simultaneously. I now had no honour left and jumped out of my pants trying to get some kind of relief. The pain outweighed my embarrassment completely. My buttocks were on fire, yet there were no ants and no hornets. It was the acid from the grass I used that was causing all the pain. There was only one solution. I took off my shoes and socks, took the water bottle and wet the socks as well as my underpants. I then did a second cleaning job that immediately soothed the pain. After getting dressed again, without underpants and socks, I looked at the client. He was watching me with eyes wide open and a try-to-hide smile on his face. To me the hunt was over. I radioed Jan Hendrik to come and pick us up as it was close to brunch time. That evening around the camp fire, Mr Know-all was doing a lot of talking to his friends in their native language. Their laughter broke the Kalahari silence many a time. Although I could not understand a word they said, I knew that I was the topic of conversation. Mr Know-all had the last say of the day. I learned one thing though... before I fasten my hunting boots in the morning at Uitspan’s hunting camp, I fill one of my pockets with toilet paper." 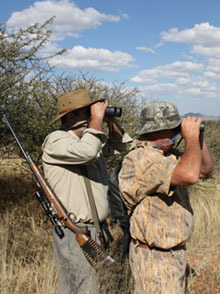 Contact us here if you are interested in hunting with us in Namibia. You are also welcome to let us know if you would like a reference list. To keep it confidential, we do not publish the mail addresses of our hunting clients on the web. "But whosoever drinketh of the water that I shall give him shall never thirst; but the water that I shall give him shall be in him a well of water springing up into everlasting life. " His mighty arm has vict'ry won. And the angel had told them this as well, for he said, "He is not here. He is risen as He said." The psalmist had stated this prophetically in Psalm 98:1 with these words, "O sing unto the Lord a new song: for He hath done marvelous things: His right hand, and His holy arm, hath gotten Him the victory." Yes, it was a victory over sin and death. When sin is conquered, death is destroyed! When guilt is gone, punishment vanishes into thin air. And Christ, as God's holy arm, removed that guilt by His death. Christ, as God's right hand, had broken the shackles of death and the grave, because our sins were paid for in full. What a victory! What a day to remember with songs of praise to God! As Paul wrote in Romans 4:25, "Who was delivered for our offences, and was raised for our justification." And the word "for" means "because of" or "on account of," so that it was on account of our justification that He was raised. He was not raised in order to justify us, but because He had done so. The world has its Easter rabbits and Easter eggs which have nothing to do with the removal of sin. They in no way even suggest this marvelous work of God accomplished through the cross of His Son. They sing the old song of sin that Satan gave them to sing, turning their thoughts away from Christ and His cross. Fear not ye, but sing this new song of a glorious victory over sin. "What a high relationship is that of a son to his father! What privileges a son has from his father! What liberties a son may take with his father! and oh! what obedience the son owes to his father, and what love the father feels towards the son! But all that, and more than that, we now have through Christ. "Behold!" ye angels! stop, ye seraphs! here is a thing more wonderful than heaven with its walls of jasper. Behold, universe! open thine eyes, O world. "Behold, what manner of love the Father hath bestowed upon us, that we should be called the sons of God." Take a moment and listen here to an online audio sermon.